So last weekend I purchased 34 pieces of pine, untreated measuring 1.8M by 42mm by 19mm. I need to find the time this evening or tomorrow to cut them all in thirds and sharpen one end of each. Obviously I am taking up the new hobby of vampire slaying. Well that or I need posts I can hammer into the ground to affix signs to for the 8 hour race this weekend at Stromlo. The first option is however so much more fun. I remember that Kendra had a favourite stake, Mr Pointy I believe. I wonder if all the 102 stakes I make need names. Coming up with 102 names for pointed wooden objects could be a challenge, and possibly boring, of course it could turn out fun, like finding an axe for every letter in the alphabet (oh no that post had Buffy as an inspiration too). If this is indeed a mountain bike race, and as it is at Stromlo where trees with branches or off cuts sturdy enough to slay vampires with may be rare still it could actually be useful to have wooden stakes easily available at each intersection in the off chance there are vampires that need slaying on the course anywhere. Sure this is only a day time 8 hour race this weekend, however the 24 hour race later in the year may have issues of this nature. Who knows. 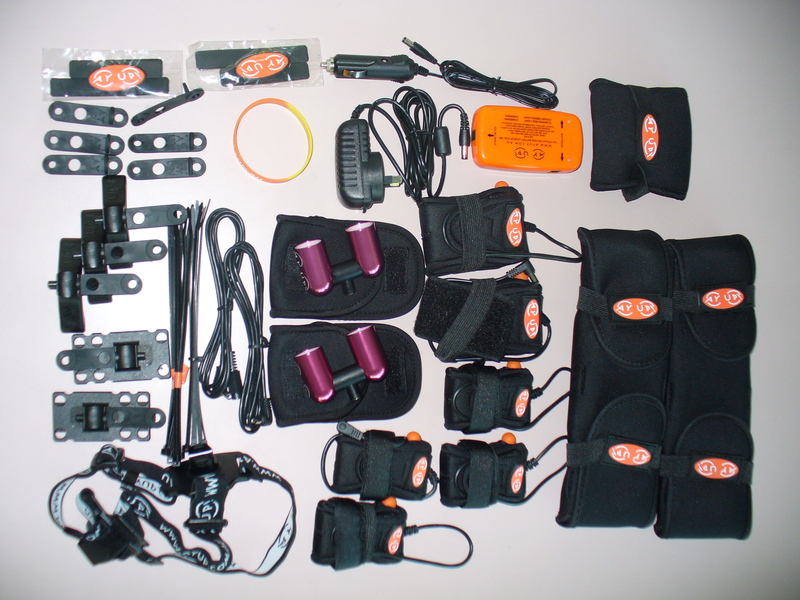 All the kit from above (fullsize) So I am sort of making bad jokes in the title of this post, however I do like my new light setup for riding/running/etc. As previously mentioned I was able to borrow some AYUP lights from my friend Danielle. 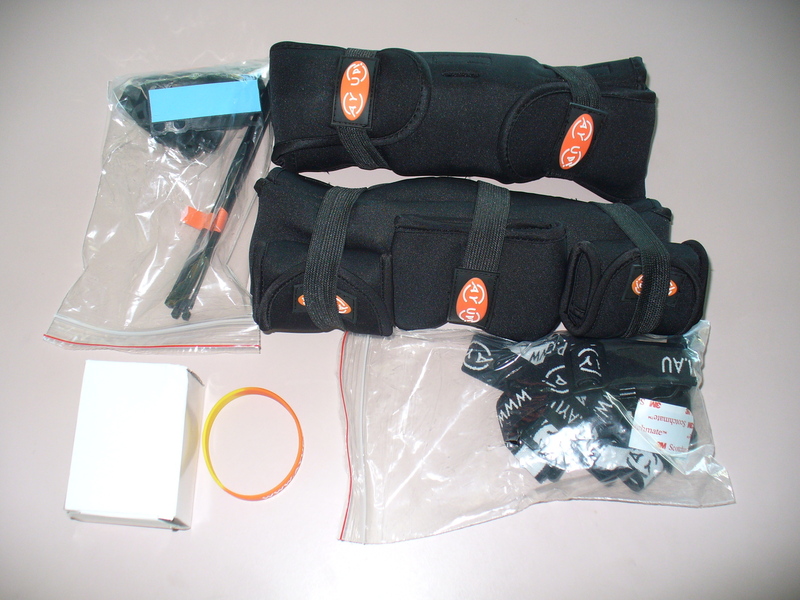 Her adventure racing team has AYUP sponsorship this year and has been able to loan sets of ayups out to people around Canberra for them to try out. I was lucky enough to use a set for a few weeks. 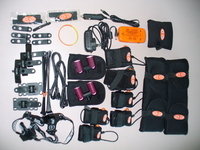 Running with them is fantastic as you have a lot of light coming out, and due to the multiple angles can have one light pointed near your feet and one light pointed ahead if you need on rough terrain. On the bikes the system is really light and provides far more useable nice light than 20 or 30 W of halogen lights ever seemed to. Also definitely more than my luxeon based Silva L1, though one would kind of expect that with 2 Cree LEDs per light in the AYUP kit. 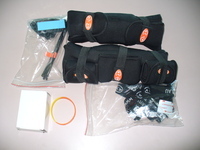 Anyway I felt the need to get a set, so $650 later I am now the owner of the 2008 Enduro kit, this gives me extra batteries, mounts, and a running head band. I also ordered another mount so I can have three of my bikes ready for them. I think anyone who knows what colour most of my race gear is can guess what colour I chose for the lights without looking at the photos on the left, good to see the shade will match my mountain bike and double kayak so well. With the 4 3 hour batteries and 2 6 hour batteries I can keep both lights lit for 12 hours non stop, or if on foot and only wanting one light a full 24 hours without recharging. All my use of the loaned set has given me a huge appreciation of having these light weight and bright lights. I look forward to lots of fun out there using this set I now have bought. Oh and I hear that from time to time when AYUP are out of stock of parts the wait can be horrendous. I was very lucky, I made my order for the lights on Tuesday and they were in my office by Friday. Rock on for quick service. Last week at work I was thinking about some of the exams run here and wondering if we could make jokes about making them harder. For example in the computer networking class. Hand the student a cage with a few pigeons and a copy of rfc1149 and to pass they have to communicate some message stored at the place the pigeons call home. Another possibility for that class was to hand them some computer equipment, such as an Altair 8800 (I think we have one in the computer museum here at work), a few components that may be able to read the outputs of that and communicate to a modern network and ask them to write the contents of a web site on a ipv6 only web server. I am sure there are many other interesting concepts for making the assessment harder, heck in reality a few years ago I was arguing for the final assignment in the computer networking class to be an exercise in exploiting a planted hole in some software. This would involve telling them some basic details about the hole. They would then have to understand network capture (wireshark), c coding (writing the exploit), manipulating network calls and sockets and data from code to get a meaningful result, layout of the system they are exploiting (we would give them references and details) and be able to analyse and collate data well. We could give each student something slightly different (we can generate each problem with some code generation mechanism) so they can not easily copy each other. Their task could be to gain some form of access through this hole and place a defined piece of data on the system they are exploiting with their implementation. At the time (and probably still) it was deemed too difficult for the class and also somewhat off focus as it had more than just computer networks topics involved. All of the initial silly ideas I was having last week though of course reminded me of the rather amusing GRADUATION EXAM - AUTHENTIC ASSESSMENT I recall seeing a printout of in the 90s sometime, a common Internet jokes item. Lets see you pass that exam in 4 hours. With a Penguin (fullsize) A little while back I noticed a new organic food shop near ANU, the mob from the Belconnen markets, As Nature Intended had opened up another shop in one of the new building developments near the Rydges hotel. They have some good (though expensive) supplies for cooking, and they have a cafe (also a little expensive) with very good coffee served. So breakfast was had yesterday at the cafe, the Vegan Big breakfast on their menu (it may be downloaded), really good home made baked beans, marinated tofu and roast veggies (they had run out of mushrooms alas) all with toast. After breakfast looking around the shop there were many tempting things. I mostly restrained myself until I saw the item pictured to the left. As a Linux geek, someone who enjoys green tea and someone who has been drinking a lot of chai recently I was unable to pass up buying this box of tea bags. 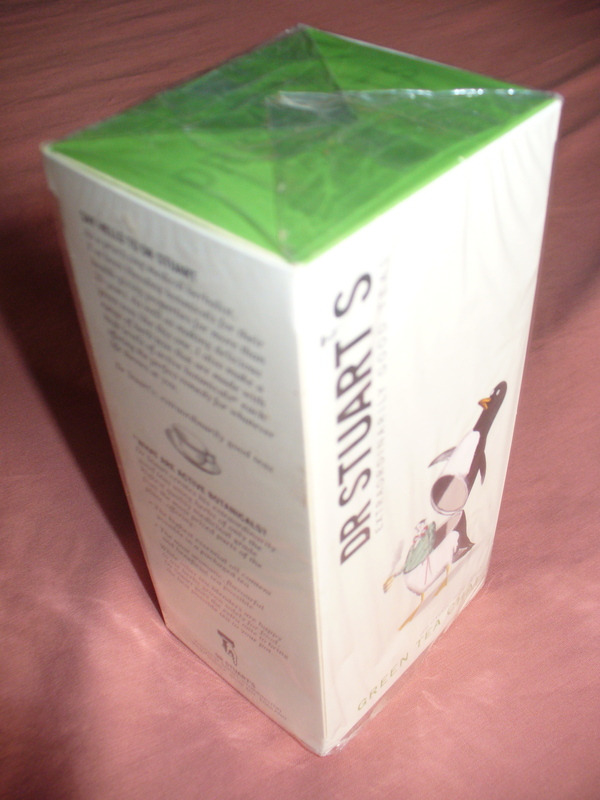 It is a penguin propped open in half with a guy drinking tea in the middle and it is chai green tea. 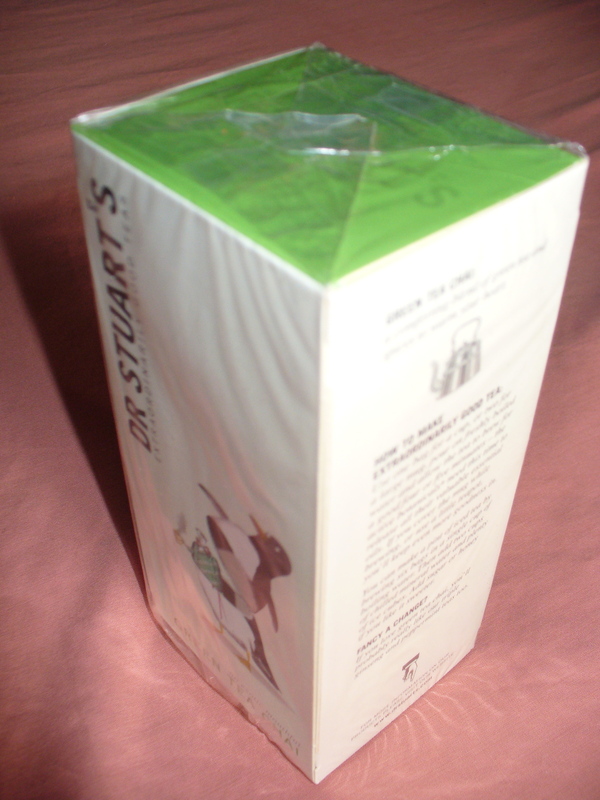 I almost suspect I will need to keep the box in my office once I finish drinking the tea contained within. How cool. Square shaped Alta Bean Bag (fullsize) A little while back I got myself a nice large bean bag so as to have a fun pink relaxing place to sit at home. 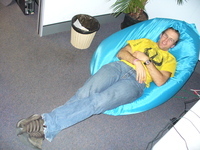 At the time when I trialled it out in my office and again that night at the Canberra Linux User Group meeting I got to thinking it would be neat to have a bean bag in the office. As for the pink bean bag at home, I can report that at first it felt a bit over full, the first few days with it I thought it could use less beans, however it has seemed to settle a bit and is more comfortable now for one or two people. I can also say that two reasonably tall people do indeed fit fairly comfortably together on it to watch a movie and/or relax. A few offices around the building have couches or similar so people can relax on them in order to comfortably read papers or similar (this is a university after all), it sounded like a good idea. 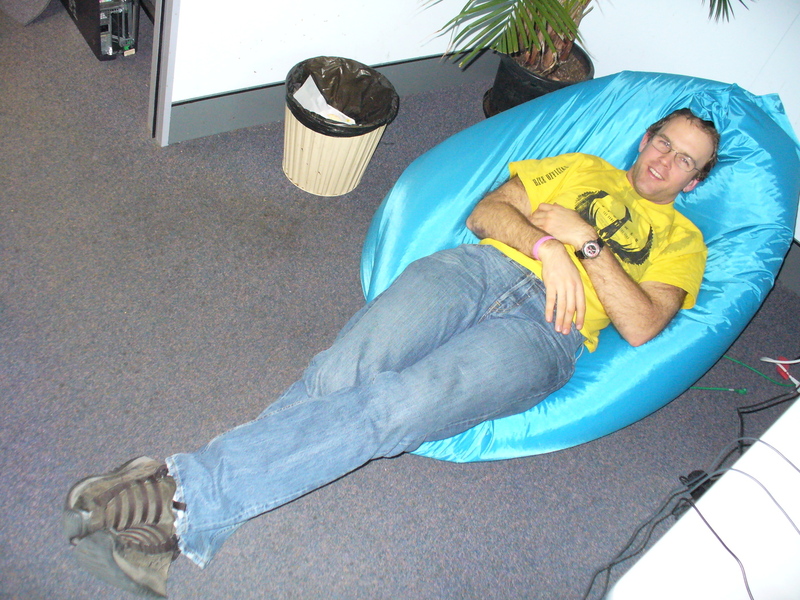 So I now have another bean bag, the people at Blob Beanbags suggested another line of bean bags they do called Alta Beanbags, the large pink bean bag was a little bit too big for my office, however the jumbo sized Alta Beanbag fits better. Yesterday I mentioned my first attempt at Roti, last night to help finish off a rather nice pumpkin, spinach and chickpea curry I thought I would take to heart some of the lessons learnt and information gleaned online. So I made more Roti. This time I used a heavy base stainless steel pan, not quite a Tawa, however I think it is the closest easily available item I had to use. I added a little bit (a few dribbles) of oil to the dough mix before starting to add water. The pan was cleaned off between the cooking of each individual Roti. A quick spray of canola oil was used on the pan surface between each Roti rather than excessive amounts floating in a wok as happened in round 1. Oh and I used self raising flour wholemeal flour. The bread tasted and felt a lot healthier than round 1, less oil throughout. The bubbles appeared during cooking once the pan base was hot enough, the first two or three Roti were cooked before the pan was hot enough I think. The main problem this time was the bread was not as flaky as good Roti often is when you get it at a restaurant, this may mean I need to fold it over some dribbles of oil once the dough is made as some sites suggested. The other even more annoying problem was that the good bubbly Roti was awfully dry, so it cracked when handled and bent a lot rather than a nice malleable bread you can easily tear and scoop with. I wonder if making the dough just a little moister will help with the dry feeling. As yummy as it all was it took a lot longer and was more labour intensive to make Roti than simply heat or cook some brown rice, thus I think I will keep Roti for occasional meals and when eating out and stick to brown rice with most of my curries and other Roti friendly dishes. Last night to accompany the curry for dinner I tried my hand at making Roti, I followed the directions on one of the first google hits for Roti Bread recipes (here), however this did not specify the amount of oil to cook with, or the need for a pan or griddle like a Tawa (heavy cast iron, thick base sort of thing). Also the lack of backing soda or SR Flour means they did not bubble much. On the whole they were still yummy and very enjoyable with the curry to eat and scoop the curry with. However I think too much oil was used in the cooking, and I used a wok, I should have used a heavy based pan or similar. Anyway I learnt a bit and plan to try again, definitely a good basic bread to make and tastes yummy fresh and hot with a curry or similar.